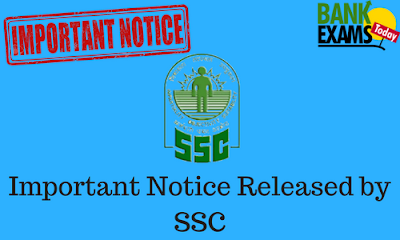 Staff Selection Commission(SSC) has recently released an important Notice for SSC CGL(Tier 2) 2017, MTS(Paper 2) 2016 & JE(Paper 1) candiadtes. The Combined Graduate Level Examination (Tier-II), 2017, earlier scheduled to be held from 18.1.2018 to 20.1.2018, has been postponed and will now be held from 17.2.2018 to 22.2.2018. The Multi-Tasking (Non-Technical) Staff Examination (Paper-II), 2016, will be held on 28.1.2018. The Junior Engineers Examination (Paper-I), 2017, earlier scheduled to be held from 22.1.2018 to 25.1.2018, will now be held from 22.1.2018 to 29.1.2018 (There will be no examination on 26th and 28th January 2018).